I had this bottle as a present from my sister for my 40th just over 5 years ago. The bottle (it comes in what looks like an oversized aftershave bottle) is long gone but I decanted the last 50ml and finally decided to drink it last night. Typical Japanese from my experience. A very light and floral nose. Jasmine, hibiscus, some orange and scented candles. Quite a thin mouthfeel. Arrival and development is all fruit oranges and plums. Some bees wax. And more plums. I've never picked up plums in a whisky as much as I have with this Hibiki. Finish is reasonably long, more fruit, some bolied sweets and bonfire toffee and has the barest, barest whispering of smoke. Is it the greatest whisky ever? No. Is it worth the huge sums people shell out for a bottle now? Of course not. But it was a beautifully balanced whisky and still the best Japanese whisky I've ever tasted (admittedly I think I've only had maybe 6 or 7). This whisky reinforces the point that @Victor makes about if you like a whisky and you think the price is reasonable then stock up. It was a present, I loved it. I decided this was a whisky I'd make damn sure I always had a bottle of in the house. I checked the price online, it was quite expensive (I think it was about £65-70 at the time. I promised myself it was worth it, I'd pick up another bottle, when I got round to it. As I watched the fill level drop I kept reminding myself to buy another. Then when I finally decided to pull the trigger the price was now over £100. Within a month every website said 'sold out'. They'd discontinued it. I wish I'd brought 3 or 4 bottles (I could sell 1 bottle and pay for the other 3 and still make a profit). I didn't add any water to this whisky but it was diluted with my tears as I drank. I'll never drink this whisky again! I have become quite a fan of Japanese whisky (especially those of Nikka) and was looking forward to tasting this offering from Suntory. I'm still a fan of Japanese whisky but less a fan of Hibiki. Nose: Quite fruity: plums (think of exceptionally dry Gekkeikan plum wine) and a bit of cherry juice. Assertive oak; estery; grains are a bit lost among all the fruit and oak. Some shy sherry notes in the background. Palate: Very light and mostly dry. The wood influence appears quickly and takes over producing a bitterness that lingers and finally closes things out. Finish: Drying with the oak tannins holding court. This is an unbalanced blend as the wood overwhelms the light character of the spirit. Seventeen years seems a bit too long for this dram and I would like to try one of the younger Hibikis (the 12 yo or their new NAS expression). Victor, it's always good to hear from you. It looks like the 17 yo just might become quite the rare beast. I was curious as to the current price of the 17 yo (my bottle was a gift from my son's mother in law!!) and looked on some of my favorite on-line sources (Whisky Exchange and Royal Mile) to see what I could find. What I found mostly was "out of stock" and "unavailable". I don't think I could have bought a bottle if I had come up with the suggested price of $130. Given the diminishing stock of old Japanese whisky it is no surprise that Suntory might have to cut this from their range in favor of younger offerings and NAS blends such as their "Harmony" blend. @jerryclyde, thanks for your excellent review. As for Hibiki 17 yo, I haven't yet had the opportunity to taste it. I like fruity and dry, but bitter oak will ruin any whisky. I'll bet you'll like the pleasant and light Hibiki 12 yo better. No wood issue that I've seen. Hibiki 17 has to be the best whisky I have tasted. It's dangerous to drink and I have to remind myself of its price. It's very well balanced and with ice it's magical to drink. I've only been into whisky for a few months, although I'm a bit of a beer and wine buff. It all started in Japan in October 2014 when I brought my father-in-law a bottle of Scotch. Although it was aged 18 years, it was single cask and was very raw, young and strong. My father-in-law slipped away. He cam back with a Suntory rare whiskey. When I tried it, it was a revelation. No burn, smooth soft and delicate. It was an expensive whisky, and a bit out of my league as a beginner,but the nearest I could get was Hibiki 17 years, which I first drunk in the Park Hyatt New York Bar, Tokyo… and it was just as good. Colour: Clear light golden brown. Nose: Plum, golden brown sugar, light vanilla, aged antique wood, wood polish, orange citrous peel, little Japanese umeboshi (sour plum), caramel. On the subtle side there's a little sandalwood, custard. Taste: Well it's smooth, no burn, which when I first tasted it, blew away every conception and prejudice I had against whisky. There's plum, citrous peel, spice, oak wood, dry aged wood, little subtle vanilla, some very light peat or charcoal, caramel, brown sugar, tobacco leaf, leather, slight floral heather note. It's tangy and a little spicy. Finish: On the finish there's some light peat or charcoal, spicy, light vanilla and oak. It's fairly long and lingering. A few minutes later there's still the peat and vanilla, and the plum is starting to come back. It's so smooth and easy to drink it still remains a revelation to me. It's not mind blowing but it's got several flavour complexes going on which all complement each other nicely. One of the most balanced, interesting blends you will every drunk and one of the best blends in the world right now. Thanks for the review. 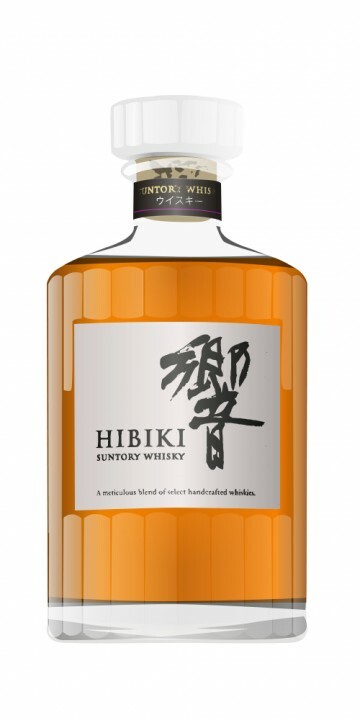 My bottle of the Hibiki 17 has certainly gone over well with newcomers and experienced scotch drinkers alike in my tastings. A shame it is not more widely available - I will have to go back to Japan for my next bottle! This 17yr old hibiki can go up against Johnnie Walker Blue Label. My friend who lives in Queensland Australia, Systemdown, and I decided to trade some whisky samples recently. It allowed us to try more whiskies for less cash in order to discover more whiskies that we both like and dislike. He'd sent me a Glen Scotia distilled in 1992 and bottled in 2009 by Gordon & Macphail, Dalmore 12 yr old, Old Pulteney 12 yr old, Suntory Hibbiki 17 yr old, Aberlour Abunadh batch 17 and a special mystery malt that very few people have ever got to try. I've since reviewed the Glen Scotia, the Dalmore 12 yr old and the Old Pulteney 12 yr old. Tonight was the Suntory Hibiki 17 yr old's turn! Now I've tried a few other Japanese whiskies before, specifically the Yamazaki 12 yr (over rated in my opinion) and the Hakushu 12 yr old (absolutely brilliant). When I cracked the sample bottle of Hibiki 17 yr old the very first odor to hit my nose is plums. Lots of plums. But on top of the plums I get some spices, I think nutmeg and cinnamon, caramel and hints of what I think are fruits, apples and pears specifically. Very awesome nose, first time I ever got plums off a whisky and very enjoyable. When I take a sip it goes bitter, feels like oak, peppers with some citrus notes. It feels like there should be more fruit there, but the bitterness is overshadowing it. The finish starts off fairly bitter and dry and is quite disappointing until you start getting to the aftertaste. There I'm detecting the slightest hint of fruit, feels like pears, but I could be wrong which partially redeems the whisky. This is a decent whisky, but sadly not a great one. Too much bitterness without much to redeem the bottle. It's not the worst whisky I've ever had, not by a long shot. Not quite sure how much this bottle runs at, but going off The Whisky Exchange I'm going to guess that it'd be a fairly difficult bottle to find in Australia and if you can find it it's likely to run $120+ for a bottle. Which it isn't worth by any means sadly. I'd much rather have the Hakushu 12 yr old over this bottle. Next up is a bottle I'm really looking forward to! Ah glad you actually got plum on the nose before it disappeared entirely. Such a fragrant nose, it was also my first Japanese plum experience and will remember this dram fondly. Unfortunately, as you found out, the palate and finish aren't up to scratch, but hey, another one to tick off the list I guess and on the whole not a bad blend at all. The plum aromas were most noticeable out of the sample bottle my friend. Had a pretty decent nose on it, but as you said the palate and finish sadly weren't so awesome. However trying new whiskies is ALWAYS fun! And you're right it's not a bad blend. Do you remember how much it ran? Hibiki is a mix of different malt whiskies from the Yamazaki and Hakushu distilleries as well as of grain whisky from the Chita distillery. The nose is quite floral, with plenty of vanilla, a hint of peach and a touch of incense - are the Mizunara casks making themselves felt here? The palate holds an interesting experience in store: it is soft and smooth at first, then there is a kick of pepper right at the end, resulting in a mouth-watering ending. The finish is sweet with a touch of grass, long and warming. I must say that this is an impressive blend that deserves the price tag that comes with it. In Japan this is frequently drunk with ice, however I like it best without the addition of water. This truly is a noble dram for all seasons! Review of a 18cl (180ml) bottle circa 2005 bottling. My first Japanese whisky experience. First reaction, from nosing of bottle immediately after cap removal is distinctly and umistakably, of plum wine. A wonderful thing to experience for the first time! I left the bottle alone for 15 minutes before pouring a dram for nosing and tasting and followed up the tasting the next day, these are combined notes with my final score. Nose: Plum wine prominent, a little "feinty" (for a 17 year old whisky? ), caramelised sugar. Caramel intensifies over time and comes to dominate. Not much else in there, except maybe a floral hint. Taste: Pepper first, followed by red wine (is that some sherry)? Light mouthfeel. A little "bitey". Pepper mellows to something vaguely reminiscent of radish while sherry dissipates, some citrus comes on too. Soft grain sweetness develops. Interesting bitter turn upon swallowing. Finish: Starts bitter. Dry. Citrus makes an appearance briefly. Quite long and warming! Bitterness dissipates. Left with some soft cereal notes and what might be a hint of that plum. Balance: Not as "harmonious" (as the translation of Hibiki implies), I find that although certain elements in this whisky work well, they do not combine in such a way as to elevate the overall experience, such as a very good whisky can do. The caramel somewhat overshadows the exquisite plum in the nose, the sherry notes (and whatever else might have been there to taste) seem to have been "muted" by the grain and there is a discord between nose and taste. Bitterness, whilst tolerable, is not beneficial and tends to be overly prominent during tasting and finishing. Overall: A good whisky, interesting, but all I'm really left with is "caramel and plum wine" and some mild annoyance at the bitterness. Not as smooth as I'd hoped for. Still a damned good blend, however! Had a follow-up dram again tonight. I usually do not add water to whiskies at 40-43% ABV, but I thought I'd give it a go and was pleasantly surprised! With the addition of water, the nose becomes floral and fruity, with an added hint of peat smoke, improving its balance noticeably as the caramel recedes from the forefront. Sadly though, the plum recedes also and is barely noticeable - but given the new found balance in the nose, it's not a major loss. The taste becomes more well rounded and balanced; now with butter and a touch of aniseed. Bitterness is reduced and finally develops into spice and wine notes. The finish is shortened, but leaves a very nice mouthfeel with a buttery finish. Wow. This is honestly the first blended whisky I like better with water. I would rate this a little higher (anything up to 85/100) except I believe a whisky should be rated at its bottled strength (unless cask strength), so will let the original verdict stand. In closing - hidden subtlety and complexity here, definitely try it with water! @systemdown, about the miniatures re: your @Pudge72 response, I am one who has had some quality issues with samples from minis, but I have to say the tastes of the 'off' minis didn't seem like an oxidative effect, e.g. "soapy" is most definitely not the product of oxidation, but a defect in production and quality control. Also, for my palate, increased oxidation usually benefits the whiskies in question, rather than harming them. 'Soapiness', for example, is usually gradually dispelled by increasing oxidation. For me, the most common pattern is that only very advanced oxidation causes deteriouration of the flavours. Also, some argue that the bottle seals are actually tighter with the screw-caps than with the corks. I really don't know how to judge the effectiveness of the the seal of the screw-caps, but it is well known that there is a failure rate of at least on the order of 5% for cork bottle stoppers. There has been lengthy discussion of the cork vs screw-cap issue elsewhere on Connosr, and also general discussions of oxidation effects. My wife Dramlette thinks that distilleries de-emphasize the quality standards of the minis and are more inclined to put their lesser batches of products there. Me? I really don't know what to think would be a reason for this, since if I were the producer or distributor I wouldn't want any questionable samples of my products floating around to discredit the name of the brand. Just bought this a few days ago and have taken a few drams... superb stuff.. The beautiful presentaion and elegant deco bottle are just the beginning... the nose offers a unique aroma of fine oak, dandelions, jasmine, almonds and cherries. The arrival is liquid silk pure as fresh snow from a mountain top... more cherries and tobacco spice on the palate like tasting a fine perfume...stunning aftertaste that lingers and warms the mouth with a long spicy-sweet tingling finish of ginger and cinnamon...This Whisky really sharpens the senses.. Highly recommended and no water required.